Find East Timor on the map. This story happened in 2008. Inaciu da Kosta now serves as the executive secretary of the Timor-Leste Mission. The staple East Timor food is rice. Other main crops include maize (corn), sweet potatoes, cassava, and taro. Popular fruits and vegetables are bananas, watermelons, mangoes, papaya, and coconuts, and cabbage, spinach, beans, cowpeas, and onions. Many families raise poultry, pigs, and goats as a source of meat, and fishing is an important source of food. What is the farthest that you have walked? 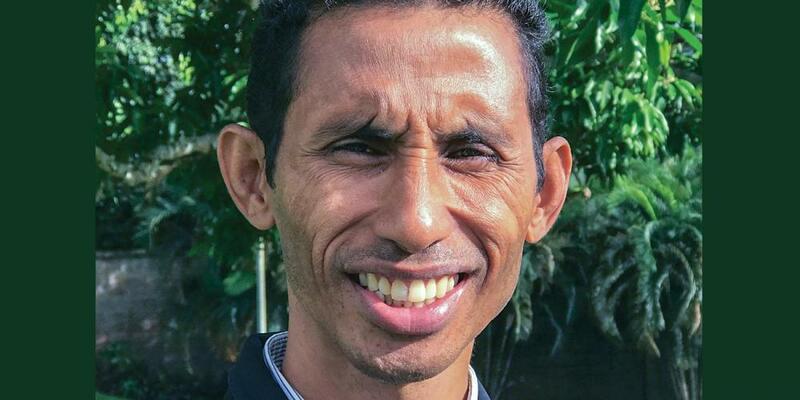 One day, pastor Inaciu, set off on a long walk on the island of East Timor. He had to travel 30 miles (50 kilometers) from his home in the town of Lospalos and up a mountain to the village of Luro. He needed to speak with a missionary in the village. Inaciu got up early in the morning, ate a breakfast of rice and leafy green vegetables prepared by his wife, and packed his Bible and umbrella. Rain fell often and unexpectedly on this tropical island, so it was a good idea to carry an umbrella. Inaciu didn’t own a car or a motorcycle, so he went by foot. Inaciu stopped at the homes of several church members along the road, and he prayed and read the Bible with them. Not many Adventists lived in East Timor, so he didn’t have many places to stop. But visits did slow him down, so he was only about two-thirds of the way to the village when it became dark. Inaciu looked at the star-lit sky and wondered what to do. He still had to walk 15 miles (25 kilometers) through a thick jungle and up a mountain to reach the village. He was hungry because he hadn’t eaten anything since breakfast. He also had forgotten to bring a flashlight. Inaciu prayed for God to guide him. He decided to press ahead to the village. The rain fell lightly at first. But as Inaciu made his way up the mountain, it began to pour. Lightning flashed, and thunder crashed. Soon Inaciu found himself deep in the jungle. Amid the pounding rain and angry thunder, he heard the roar of something else. It was the sound of a rushing river. But he could not see anything. Fear swept over him. Inaciu stood still for about five minutes, wondering what to do. Then bright lightning flashed, and he caught a glimpse of the wide river ahead. A moment later, lightning streaked across the night sky again, and Inaciu saw the river clearly before him. To his surprise, the lightning didn’t flicker out but kept on shining like the sun, making the jungle as bright as day. He saw fallen trees scattered in the river. He ran down to the water’s edge and jumped from one log to the next until he crossed the river. When he reached the other side, the lightning disappeared with an enormous boom of thunder. The lightning had illuminated the river for two whole minutes. Inaciu immediately thanked God for the miracle. Several hours later, at midnight, he arrived in the village and told the missionary about the miraculous lightning. The two men prayed together and thanked God for the safe trip. Part of a 2015 Thirteenth Sabbath Offering helped build the first Seventh-day Adventist school in East Timor’s capital, Dili. Only 573 Adventists live on the island of 1.2 million people, and the school is playing an important role in sharing Jesus.